This is always a difficult task, but also one I enjoy, because it reminds me of all the wonderful books I’ve read in a year full of new discoveries. I have been incredibly lucky to be introduced to some great reads, one by reading the monthly recommended reads by bookseller Waterstones, taking part in blog tours and also by reading the reviews of fellow readers and bloggers. I have broken it down into favourite fiction and non fiction reads and the lists are not in any particular order, except for Tin Man and The Gustav Sonata which were book that spoke to me and made my heart sing. Some books are special, they remind me why I read books, Tin Man is one of those books. A beautifully written story about friendship and love, it will forever be one of my all time favourite reads. It’s both heartbreaking and uplifting. This is another book about friendship and love and the fine line that divides the two. I adored it and the writing is simply stunning. I have read a lot of Scandinivian and Nordic Noir this year and they have all been excellent. The Man Who Died was my favourite of an exceptional genre overflowing with talent, because of the darkly comedic element to it. I bought this because I liked his autiobiograpthical books and wanted to know if he could translate his warm and inclusive writing style over to a novel. I am happy to say that he can. It’s a gentle tale about the cost of secrets and lives frustrated by unfilled needs and ambitions. I loved not only the superb characterisation in this book, but also how Jessie Burton teases the threads that connect the past to 1968 and weaves them into story about love and betrayal. The Ashes of London by Andrew Taylor. I love a good solid historical drama and this book is certainly that. I feel in love with the flawed but easy to love Lucy Barton and the friends that are part of her life. It left me wanted to know more about them all. I really enjoyed all the books in this series, but not having room to fit them all in this list, I picked this one because of the way it dealt with some very dark issues, without the novel being swamped in clichéd drama. Maria In The Moon by Louise Beech. Louise Beech delivers a haunting and moving book, about the power of the human heart to survive through trauma and adversity. The Tobacconist by Robert Seethaler. Robert Seethaler delivers a deeply moving and lyrical story about the power of the individual when faced with horrifying events, that threaten their world and those they care about. I had been meaning to read this for some time and when I saw this in a small independent bookshop in Monmouth with a stunning vintage cover, I had to buy it. The story within is a deeply moving story of grief and recovery. I like Graham Norton and found his autobiograpthy to be a funny and warm read. Yet again another honest and funny book from the king of chat show programmes. Having loved reading Gerald Durrell’s books set in Corfu and watching the TV programme based on them, I found this look at the real Durrell’s behind the stories a fascinating read. Poem for the Day One With A Forward by Wendy Cope. I received this as a Christmas Present last year. It has been a joy to dip into it everyday. I have discovered a love of W Auden’s incredible poetry and will be reading book two in 2018. My most anticipated reads of 2018. Having adored The Trouble With Goats and Sheep I’m excited about Joanna Cannon’s second book, Three Things About Elsie. Just reading the book description has me feeling this will be in my top reads of 2018. I rarely pre-order books, the last being the stunning Tin Man, but I will with this novel, her writing is worth any amount of money! From the author of The Trouble With Goats and Sheep, this book will teach you many things, but here are three of them: 1) The fine threads of humanity will connect us all forever. 2) There is so very much more to anyone than the worst thing they have ever done. 3) Even the smallest life can leave the loudest echo. I can’t begin to explain how excited I am about this new Madeline Miller release and how long the wait has seemed and continues to seem before we can read it. I fell deeply in love with The Song For Achilles, which reduced me to a sobbing mess. I feel oddly nervous though about reading Circe, because of how much her first book continues to mean to me. Will her new novel also become a much loved read? Only time will tell! Is it April yet? I am a massive fans of this author’s books and so I am excited to discover she has a new book out next year. Given that she is one of my go to authors I will be reading this book as soon as I download it. Bringing sixteenth-century Languedoc vividly to life, Kate Mosse’s The Burning Chambers is a gripping story of love and betrayal, mysteries and secrets; of war and adventure, conspiracies and divided loyalties. Carcassonne 1562: Nineteen-year-old Minou Joubert receives an anonymous letter at her father’s bookshop. Sealed with a distinctive family crest, it contains just five words: She Knows you live. After falling in love with Kate Atkinson’s writing after reading Life after Life, I’m looking forward to reading her new book Transcription. If it’s half as good, it will be a fabulous and addictive read. These are just some of the books I’m looking forward to reading. Looks like it’s going to be another exciting reading year in 2018.
Review ~ The Christmas Tale of Elaine Gale by Daniel Thompson and illustrated by Connor Edwards. Firstly I wish to thank author Daniel Thompson for the ARC copy of The Christmas Tale of Elaine Gale in return for an honest review. Now I am the first to admit that I am not the biggest fan of Christmas, I am in fact a bit of a bar humbug, so a book set during this festive season needs to be really good to get a 5* rating from me! Well I really enjoyed it. In fact it might have managed to make me rethink my attitude towards books centred around this period! Why did I love it so much? It has a modern, determined girl as a heroine, who leads her younger brothers on a festive adventure. There is an evil snow queen, who brilliantly breaks with tradition by not being male and reminds me of the White Queen from The Lion, The Witch and The Wardrobe. The rhyming verse has a catchy contemporary feel to it, flows along without interruption from misplaced words and creates a story that charmed me with the way its paints a such modern Christmas tale. The main elements are there, Santa and his reindeer and the theme that to get presents on Christmas morning you need to think of others and be good, yet it doesn’t become overly sentimental, which my niece and god-children will adore. It reads well for adults reading to younger children and will serve as a great introduction for older children of rhyming verse. Special mention must also go to illustrator Connor Edwards who has produced illustrations that compliement the story perfectly. They are fun and attractive to look at. They remind me of illustrations seen in graphic novels, with a boldness and quirkiness children will love. The Christmas Tale of Elaine Page is one of the best children’s books I have read this year and I think it will become a firm family favourite in years to come. It can also be purchased from The Christmas Tale of Elaine Gale Website , where you can also learn more about the book and how it can onto being. For more news about the book you can visit Facebook / Twitter/Webpage. Blog Tour~Guest Post ~ Tall Chimneys by Allie Cresswell. I am lucky to be able to feature a guest post by the writer of Tall Chimneys today. Allie Cresswell tells us why she writes and what it means to be a writer. Years ago I sat on a bus in front of two women who were discussing the colour of the Mother-of-the-Bride outfit one of them had bought the week before. I was hooked; crucially invested in establishing the colour of the frock. ‘Peach?’ I muttered into the damp air of the bus. ‘Peach?’ they took my suggestion up. The Mother of the Bride considered. ‘On the peach side of apricot,’ she agreed, at last. I relate this incident because it illustrates a lot about why I am a writer and the writing process. Situations like the one on the bus are meat and drink to a writer. All of life is material to her ever-eager eye and attentive ear. I am a terrible eaves-dropper, as demonstrated above, and I am very nosey. I ferret story out of the least snippet of overheard chat, from encounters briefly glimpsed in the supermarket aisle. For me, they are laced around with narrative potential. Before I know it I am inventing dialogue, defining character, conjuring a world of history from the peculiar slouch of a hat over an eye, or a stretched-out silence over a neighbouring restaurant table. Writing is my way of coping with the fragmentary nature of life; we never see everything, we never know the whole story. I’ll never know where on the colour spectrum that lady’s outfit belonged, or how it looked when it was on, or whether (as I rather suspect she did) her neighbour turned up to the evening-do in something very similar (‘if you’d said yours was cantaloupe, I’d never have worn this old thing.’). Life’s narrative is always being interrupted by time or diverted by distance. But as a writer I can draw the threads together again and reconnect the severed ends. I like the wholeness of it, the unity. I use my writing to test out and explore universal themes, to question big ideas like family (in Relative Strangers) and consequences (Lost Boys). I use it to tread the roads I have not taken in real life as well as to anatomise in surgical detail every false step and foolhardy choice I ever made. They say that writing is good therapy, and it really is; you can probe the most delicate and profound of issues and often make more sense of them on the page than you can in real life. Of course you can control the outcome, too, unravelling fashion faux pas to knit back into a successful garment. The effort involved in arriving at this truthfulness is considerable. It is a process of second-guessing: would he really say that, given what has gone before? What does a thing really look like, smell like, sound like? It has to be right to be real. The efforts of the women on the bus to establish the colour of the frock – the nudging and tweaking, the counter-suggesting, honing and refining – is exactly the process I go through when trying to describe something, to make it vivid and tangible. Writing is all about connection. I felt connected to the women on the bus, a small cog in the machine of their relationship. It is an essential aspect of our humanity, this desire and ability to communicate and connect with one another, to be part of something that is bigger and more important than just ‘me’. I mean the shared understanding of one person with another, and of the individual with the wider world. Don’t we, when we hear a piece of music, or stare out at night into the star-peppered sky, feel some inner part of us reaching out and becoming part of it? Aren’t there moments, with a dear friend or, sometimes, even with a stranger, when we know a better peace than we can ever have alone? We experience, just for those moments, a kind of synchronicity; what Mr Spock calls ‘mind-meld’. For me, writing is spiritual. When things are going well, I lose myself in it (in reading, also). I have no corporeal awareness while I am writing. Hours pass without my having any consciousness of them. I only know what I am reaching out towards something, trying, in the creative process, to touch some truth. Choosing words, dismissing them, choosing better words, sharpening and clarifying, adding texture and hue which will give it – whatever it is – real substance. And then painting in the shadows, the echoes and smells, the antipathies and sudden moods, those resonances which emanate only from that which is true. I take in what life offers me and garner it into the crucible which is my imagination. What happens there, I don’t know – some spark, some mystery I can’t explain. The elements rearrange themselves; they coalesce with snippets and fragments I have forgotten about, some metamorphosis happens which is all of me and yet at the same time nothing to do with me. Something entirely new and independent emerges and I set it free in the hope that it will enrich others as it has enriched me. Thank you Allie for taking the time to write such a fascinating post and Rachel Gilbey for inviting me to be part of the blog tour for Tall Chimney’s. Tall Chimneys can be bought from Amazon. Blog Tour ~ Review ~ Foul Trade by B K Duncan. Firstly I would like to thank Bloodhound Books, BK Duncan and blog tour organiser Sarah Hardy for the ARC copy of this book in return for an honest review. Having read the short story introduction to this book The Last Post, I was looking forward to spending more time in the company of the indomitable May Keaps. Holding down a job as a Coroner’s Officer at a time when such jobs were mainly the remit of men, she is a refreshing change from period stories that only feature men in such roles. As a character she is strong-minded, intelligent and very likeable and for me she makes this book the success it is. There are many other great characters who play strong supporting roles in the story. Not least the victim himself, whose back story is integral to the mystery at the heart of the book. We are given enough information to keep us addicted to the story and invested enough to hope May catches the killer. As for the story itself, it’s full of plenty of drama that keep me turning the pages desperate to know that characters I was fond survived the drama that enveloped them. BK Duncan wrong footed me when it came to the main protagonist of the story, in fact she weaved in so many twists and turns that I was giddy at the end of the novel! The skill in which she evoked the horror of war in……is present in Foul Trade as well. The claustrophobic back streets of London, the bustling activity on the docks and the menacing atmosphere of the dung dens are all brought vividly to life. You feel that you’re walking those streets with May and can feel the mounting horror and violence that haunts her footsteps. If you’re looking for a really good historical drama that will envelope you in the story, then Foul Trade should be your next read. I am certainly looking forward to reading more of May Keaps adventures. The author can be followed on the following social media sites. Book Review ~ Holding by Graham Norton. The remote Irish village of Duneen has known little drama; and yet its inhabitants are troubled. Sergeant PJ Collins hasn’t always been this overweight; mother of two Brid Riordan hasn’t always been an alcoholic; and elegant Evelyn Ross hasn’t always felt that her life was a total waste. So when human remains are discovered on an old farm, suspected to be that of Tommy Burke – a former love of both Brid and Evelyn – the village’s dark past begins to unravel. As the frustrated PJ struggles to solve a genuine case for the first time in his life, he unearths a community’s worth of anger and resentments, secrets and regret. Darkly comic, touching and at times profoundly sad. Graham Norton employs his acerbic wit to breathe life into a host of lovable characters, and explore – with searing honesty – the complexities and contradictions that make us human. When reading a novel written by a ‘celebrity’, I find myself wondering if the book will live up to the hype. Well I’m delighted to say that Holding by Graham Norton does. Having read his autobiographies I knew he could write and that he does so with warmth, and I was thrilled that his first novel is funny, tender and heartbreaking sad in places, yet has a warmth and tenderness that leaves your heart aching for all the characters endure. He has an eye for the sorrow a heart can be broken by, yet at the same time the amazing capacity it can have to move on and find the strength to endure. All the characters within its pages are loveable in some way and I become invested in the hope that they would survive all the drama their small and seemingly quiet community endure. Below the service of this apparently quiet Irish idyll, are a group of people caught up in a whirlwind secrets and painful regrets. They all have something that draws you to them, wanting to know what their secrets are. Graham Norton displays in his writing an intrinsic understanding of the complexities of human nature. I found myself wanting to hug those whose hearts had endured so much pain, even those who had done wrong, were not your stereotypical villain, because you could understand where that action had come from, even while understanding the pain this had brought to those they sort to love and protect. Writing the review weeks on from reading Holding, my heart still aches a little for the PJ, Bird and Evelyn and I find myself wishing Graham Norton would write a second novel featuring them, so I can find closure. But life is not made up of tidy endings, so I am left with the hope that this at least will not be the only novel he writes, because we need more from such a wonderfully perceptive writer. Holding can be purchased from Amazon, Waterstones and all good bookseller’s. Graham can be followed on Twitter. Holding was published by Hodder and Stoughton. Blog Tour~ Review~ The Other Mother by J.A.Baker. I would like to thank the publishers Blood Books, the author and blog tour organiser Sarah Hardy for the ARC of The Other Mother in return for an honest review. This is a first class thriller by an assured writer at the top of their game. It’s not like a horse pelting out of the gates at full pelt towards the finish line. This cleverly written story is like an intricate Jigsaw. Piece by piece the writer drops clues into the story and by the end has formed a complex picture of relationships, which are connected by tragedy and heartbreak. Its focus is on revenge and the havoc it can cause to those caught up in its self destructive cycle. I loved the way the writer tied the past to the future, by weaving the two stories together, leaving you guessing to the last moment before she revealed who is responsible for the child’s death. The overall feeling of this psychological thriller is that it is tense, edgy and dark and it works because each piece of the puzzle is placed together with meticulous care. The characters are beautifully drawn. Their need for revenge is explained and makes total sense. We ourselves might have no experience of such devastating loss, but we can, because of the background of these characters, maybe appreciate what drives them to seek redress for all the pain they have endured. While on the other side, we can understand why other’s run from a past too horrible for us to truly comprehend how they suffered. All three women have complicated pasts, their lives consumed by secrets that threat to destroy them all. It is an excellent read and a really exciting page turner. I must read for thriller fans and anyone who likes to sit down to a top class read. J A Baker can be followed on the following social media sites. Ahead of my review of book six in the PC Grant series The Hanging Tree, I wanted to write a blog post about why I love this urban fantasy series so much. The question is why do I love this series of books so much? Its simple, I love fantasy and I’m partial to a good police drama! So the PC Grant series of books which is a crossover of the two genres is perfect reading material for me! Think adult Harry Potter meets Cormoran Strike and you will pretty much know what to expect! Grant is a Police Officer, but a pretty unique one, as he is an apprentice wizard. He has moved from the mainstream force and into the Met’s Economic and Specialist Crime Unit 9, also known as ‘The Folly’. His adventures are mainly set in London and he encounters, ghosts, unicorns, temperamental river gods, while solving crimes with a magical element to them. Admittedly I have grown up reading and loving fantasy, so these books were always going to appeal to me. But saying that, I’d never recommend them if they weren’t well written, with the best elements of both genres. I love all the supporting characters, importantly; as it’s rare an individual creation can carry a story. Aaronovitch gives us a wealth out of the ordinary, peculiar and fantastical characters such as Mama Thames, The River Goddess of Britain’s greatest waterway and Molly the Folly’s live in domestic help. Far from human, little is known of where she comes from, yet she looks after Grant and his boss Detective Chief Inspector Thomas Nightingale like a protective mother hen. There are plenty of human characters, such as Grant and his sidekick Lesley, so don’t be put off by the magical elements in the books. All the books in the series are a pure delight, written with a lightness of touch often missing from gritty detective thrillers and the story is less convoluted than many fantasy books. They are simply urban fantasy at its best. 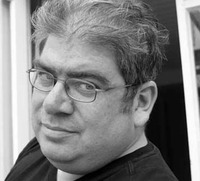 The comedy element adds to the enjoyment of Aaronovitch’s tales of murder, bad behaviour and paranormal activity, giving us as the reader an alternative view of the daily activities of the London underworld and the police, who have to keep a lid on the criminal activity threatening to implode London’s outwardly calm exterior. I maybe the only one, but I love the idea that just below the streets of London, another fantastical world exists and within that a naughty/mischievous/evil (take pick its all there in these books) element exists. But it’s all okay because The Folly and Peter Grant are there working to protect us. Ben Aaronovitch’s career started with a bang writing for Doctor Who, subsided in the middle and then, as is traditional, a third act resurgence with the bestselling Rivers of London series. Born and raised in London he says that he’ll leave his home when they prise his city out of his cold dead fingers. Blog Tour ~ Review~ Tails of Friendship by Sally Grace. Sally Grace is a professional photographer and specialises in working with children and dogs. Sally works from her photographic studio in Surrey. Many thanks to the author, Clink Street Publishing and blog tour organiser Rachel Gilbey for the ARC of Tails of Friendship in return for an honest review. I have always wanted my blog to celebrate all things book related and so was delighted when I got the chance to read and review this delightful combination of quotes and pictures. In acharming series of quotes and pictures of dogs and their owners Sally Grace pays homage to the remarkable friendships that develop between dogs and their loving families. The pictures are stunning and work perfectly with the accompanying quotes, because Sally Grace captures this relationship with great skill and is a gifted photographer. What I loved about this book was I couldn’t stop smiling while reading it. The quotes made me smile and nod in agreement and the photo’s summed up the relationship between dogs and their owners for me. Tails of Friendship has a warmth within it’s pages that makes you feel happy and how many books do that? A book that will bring happiness to dog lovers would make a perfect gift for those dog lover’s in your life. Tails of Friendship can be purchased from Amazon and Barnes and Noble. Sally Grace is a professional photographer of over twenty years specializing in portraits of children and pets and a mom to five children. She works out of her studio in Surrey. In her youth, she was a prolific tennis player, winning a number of tournaments as a junior player and competing for the national team of Great Britain. This is her first collection of photographs. Sally can follow Sally Grace on the following social media sites. Blog Tour ~Review ~ Your Next by Michael Fowler. I would like to thank the author Michael Fowler and blog tour organiser Caroline Vincent for the ARC copy of Your Next in return for an honest review. This is a first class thriller and a real page turner, so much so that I lost hours within it’s pages. What stood out for me and made it such a satisfying read was how much I loved the heroine Scarlett and how much I hated the villain James. They were the perfect foils to each other. Scarlett is my favourite type of female lead. Strong, determined and capable. Not for her a reduced role as someone’s side kick, she is a great character who doesn’t need to be trailing behind a grumpy male defective. Scarlett is front and centre of this story and I loved that. Opposite her is the twisted killer James. He is suitably evil and left me feeling cold. I loved that he was given a voice in the novel, so we could see how depraved he was. He made me shudder as all killers in a novel should. It’s a book full of tension and darkness. You read on and on, to see if Scarlett will bring James’s to justice. The twists and turns, knock you off balance all to often and this forced me as a reader more than once, to readjust my thoughts on how it would end. It’s a first rate read and I wouldn’t hesitate to recommend it to others. You can buy Your Next from Amazon UK.